Most of the time the Synchronization process will work fine and run without you ever having to think about. For those times when some troubleshooting is required, there is a parallel quality control system in place called the Synchronization Audit. The Synchronization Audit records that summarize the Documents in the database at the time. A record is created for every day, store, station, document type and document sub-type which indicates the starting transaction serial number, the ending transaction serial number as well as the net quantity of items on those documents. These records are stored as entries in the Sync Audit Catalog. The audit records are created during the synchronization process and are synched from the Remote to the Main and from the Main to the Remote. These documents are matched and if the Remote copy matches the Main copy the document is indicated as having a pair. (Note: The Sync Audit files are sent as synchronization files with the .xin extension, which have no date. Those records that have not been paired will be sent every time there is a synchronization. You can always change the dates for which Sync Audit files are created by changing the configuration). Once the Sync Audit records have been paired, you can run a report that lists all records that have been paired so you can compare the documents that are at the Main vs. the ones that are at a given Remote. If all Sync Audit records have been correctly paired and there are no discrepancies then you know that the Synchronization process has been completed without a hitch. IMPORTANT NOTE: Since the Sync Audit records must be sent sent in both direction (Main to Remote and vice-versa), it takes two full synchronization cycles for both sets of records to appear in both places. Therefore each Sync Audit record will only show whether it has been paired after two days or two synchronization cycles. If the Synchronization Audit does show inconsistencies you will want to Troubleshoot the Synchronization and Test the FTP Server. To use the Synchronization Audit you must first configure the date from which Sync Audit records should be created. 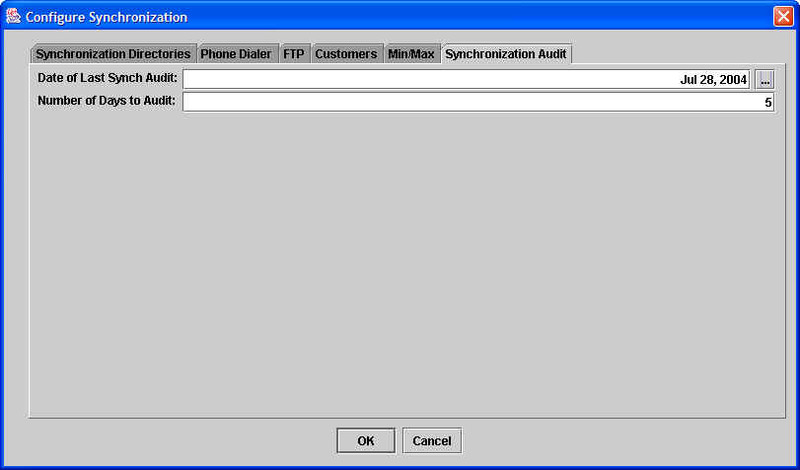 This is done by going to the Synchronize>Configure>Configure Synchroniztion window and select the Synchronization Audit tab. The Date of Last Audit is the last date that Sync Audit records were created. Number of Days to Audit is the number of days prior to the Date of Last Audit that XpertMart™ will create or update Sync Audit records. In the example above, Sync Audit records will be created for July 23, 2004 - July 28, 2004. These 5 prior days are used so that Sync Audit records that may have been delayed to due to a synchronization problem can also be included. The Sync Audit process is run automatically as part of the synchronization. 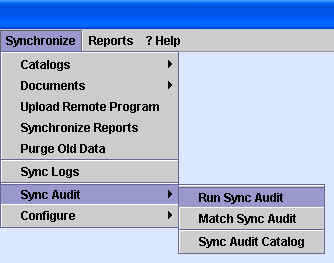 However, you can always run it manually by going to Synchronize>Sync Audit>Run Sync Audit. The process should run quickly. You will see a window flash on the screen indicating that the system is creating the sync audit records. None of the fields in the Sync Audit catalog is editable. The records are generated and updated automatically by the syste during the Sync Audit process. They are for reference only. 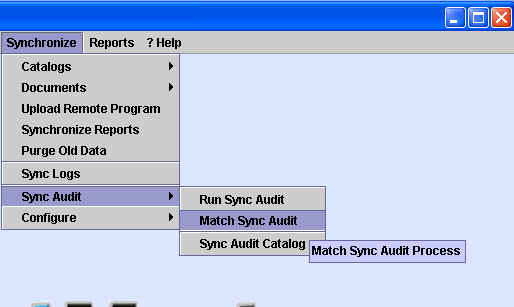 Once the Match Sync Audit proces is done, run the Match Sync Audit report to find records that have not been paired. In the example below, there is an entry for Invoices made on February 18, 2004 at Store #4 (Oakridge) that have not been matched up. These are Invoices #40000003 through #40000006. There are a total of 42 items on these four invoices. Now if the date of this report is February 18th or 19th, there is probably nothing to worrry about since the Main's Sync Audit record is probably still in transit back to the Oakridge store. However, if this report were being run any later, it would most likely indicated that there had been a synchronization problem at some point between the Main and Oakridge store.